Recent progress in neuroimaging has paved the way for modalities that allow elucidation not only of brain structure but also of brain function. Among these developments is functional magnetic resonance imaging (fMRI), a noninvasive, high-spatial-resolution method that records bloodoxygenation-level-dependent signals in the brain to track hemodynamic responses that indirectly measure brain activity (Fovet, Jardri, and Linden 2015). Further technological advancements in fMRI then allowed analysis and display of functional information in real time, expanding fMRI’s capabilities in clinical diagnosis and opening up its potential for use as treatment via real-time fMRI neurofeedback (rtfMRI-NF). In rtfMRI-NF, patients use representations of real-time reported brain activity patterns to facilitate learned self-regulation with the goal of changing behavior, cognition, or brain function (Stoeckel et al. 2014). 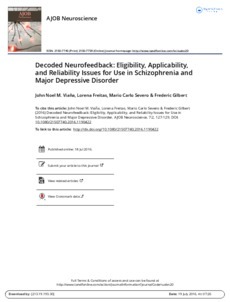 This has been taken a step further with the introduction of decoded neurofeedback (Shibata et al. 2011), which applies a multivariate analysis to real-time fMRI feedback (Esmail and Linden 2011), expanding its spatial specificity and selection flexibility and allowing for an approach that is not a priori in defining neural networks of interest (Esmail and Linden 2011). Ultimately, real-time fMRI decoded neurofeedback (dNF) could bring potential new treatments for mental disorders.